Participants see Flip the Fleet as an independent, and therefore credible, source of EV information and support. Funding could come from a variety of sources, so long as independence and scientific integrity remain firmly intact. Members feel any funding procured should be divided to mutually support organisation and analytics, tools and test equipment, and conferences and workshops, with much of the media presence able to be carried out at little or no cost to the project. The poll was sent to 798 participants in Flip the Fleet on 25 May 2018. There were 428 responses by 4 June, 311 of which provided detailed comments and answers to 6 other questions, including the question analysed here. Respondents were invited to tick as many options as they wished and were prompted to specify details if they chose ‘Other’. 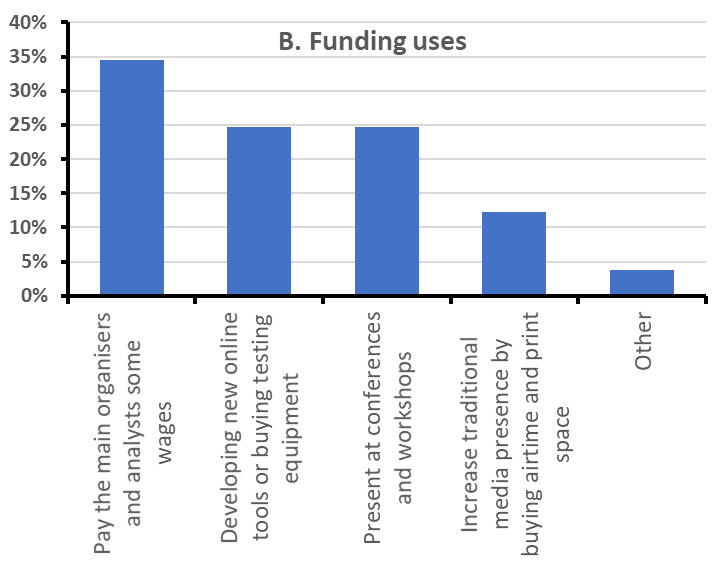 Participants were most supportive of obtaining funds from independent bodies (33% of all choices for this question; Fig. 1), but also comfortable with accepting sponsorship and co-funding from industry (21%) and charging license fees for Flip the Fleet’s technology and services (18%). Selling anonymised data (13%) and accepting donations (11%) received moderate support. Amongst the ‘Other’ sources (4%) was additional support for industry sponsorship, a call for government to help fund Flip the Fleet operations as part of their emission reduction scheme, and a query about the need to source funding for a citizen-led project. Figure.1 Percent of 652 choices by 311 participants in a survey of where Flip the Fleet could get its funding, May-June 2018. Participants were happy to use funds for paying organisers and analysts (34%; Fig. 2). Yaahhhh… that’s us! There is also considerable support for tool development (25%) and presenting results at conferences and workshops (25%). Commissioning media to promote EVs received moderate support (12%). Amongst the ‘Other’ sources (4%), the most frequent were “Unsure” and “No Comment”, with too little information about Flip the Fleet’s future plans to make informed choices. Others highlighted local gatherings and EV facilities as worthy investments and focal points for funding to be used wisely. Figure.2 Percent of 638 choices by 311 participants in a survey of what Flip the Fleet could spend any funding on, May-June 2018. The table below searched for correlations between expected success of Flip the Fleet to the answers they gave for acceptable funding sources and uses. Actually, opinion about where funding should come from and go to were a fairly evenly distributed across the participants expectation for project success. Those agreeing and strongly agreeing in Flip the Fleet’s ability to accelerate EV uptake seem to be more open to a licensing charge to Flip the Fleet. In view of the even responses, we have pooled all the comments in the analysis that follows. 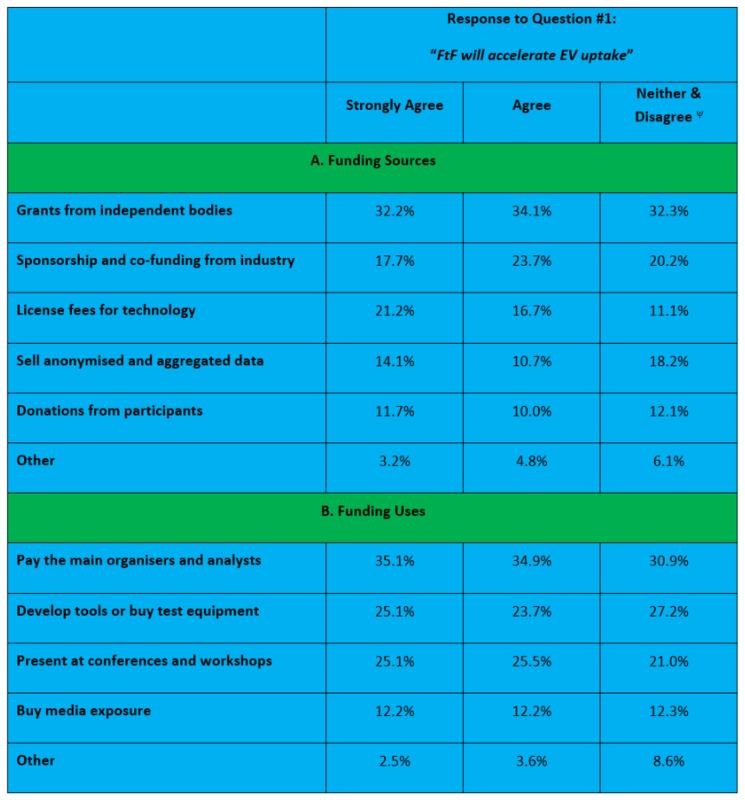 Table 1: Responses to questions about sources and uses of funding differentiated between responses that “Strongly agree”, “Agree” or “Neither agree nor disagree” of ‘Disagree” that Flip the Fleet will accelerate EV uptake. y Includes 5 choices by people who chose “disagree” with the main survey question. Here’s a word cloud of the comments you provided to the funding sources question, using the ‘Wordle’ package: the larger the font, the more times that word appeared in your testimony (Fig. 3). Figure 3. 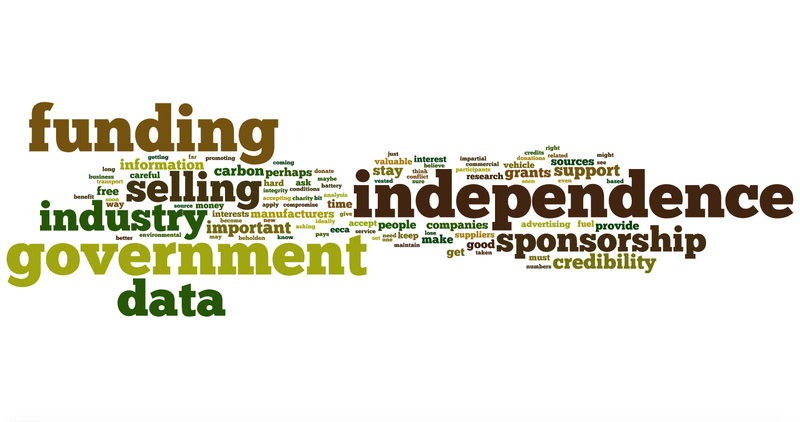 A word cloud of the most frequent 100 words used in your responses to the funding sources question of the survey. The larger the word, the more often you mentioned it. Similar words were combined for this analysis to give a better indication of the language used and its intent. For example, “independence” encompasses independent and independant, “funding” is grouped with funds, fundraising, and fund, and “sell” includes selling. Common words such as “EV”, “Flip the Fleet”, “Leaf”, “like”, “obviously” and “please” were removed (not to take away from your politeness!). “Funding” topped the funding sources word cloud in terms of frequency and therefore size – unsurprising as this was the topic in question. But the key signal from the start is that “independence” concerns and “government” roles were front and centre of your feedback. “Independence” was communicated as being paramount for Flip the Fleet to maintain credibility and scientific integrity. One of you poised it as a rhetorical question: “..would I trust you if you were sponsored by BMW? !” Another said: “As soon as you touch industry money, I believe all credibility would be lost”. In fairly accurate summary: “Any fundraising must not be allowed to compromise the credibility of Flip the Fleet”. It’s great to hear that you see Flip the Fleet as already having attained trust and a high level of credibility! Some of you felt very strongly that we should not sell data, even if anonymised e.g. “Don’t sell any data ever. Doing so undermines your credibility which is currently beyond question”. Part of their concern relates to data security: “No amount of anonymising and aggregating works if hackers are determined to steal private data”. Others were comfortable about that aspect (see Fig. 1). e.g. “Sell data back to battery and EV manufacturers”. The government was seen by the majority of you as the safest and most appropriate source for funding. With our current government communicating an agenda to up funding in the sustainability realm (in particular prioritising reduction in carbon emissions), funds coming from this source are more likely to avoid a conflict of interest. One participant explained: “..the Government should help out, so far promotion on a NZ wide scale is non-existent. They have set the timeline for carbon reduction” while another pointed out: “Surely the government can provide some monetary support, since they are pushing hard for EV uptake.” Another quite rightly mentioned “NZTA and other government organisations cite Flip the Fleet data.” Leading to the direction to “Ask them for support. Include it in license fee?” Government funding would allow for greater independence by side-stepping those with vested interests and highlighting a path that may offer greater sovereignty. Any independent grant awarding bodies were considered ideal (see Fig. 1), but in practice nearly all of these are provided by government funds in New Zealand. The remaining large players in the word cloud were data, industry and sponsorship. Taken together these underpin the second most agreed upon funding source behind independent bodies. The comments reveal that industry funding was a split hot topic; with participants talking up industry involvement while others were firmly against it. It was made pretty clear by some that Flip the Fleet was not to “become beholden to EV suppliers. Ideally, don’t even give the impression that you *might* be beholden”. Others urged: “It is vital to be seen to be independent from all industry/commercial/self-interested sources”. “Please don’t get in bed with industry. You will lose significant credibility regardless of safeguards.” Others supported careful acceptance of sponsorships of the second level businesses, provided we excluded vehicle manufacturers or fuel suppliers. For some, electricity suppliers were examples of acceptable donors who had a direct interest in EV uptake but were not selling a particular product (beyond supply contract and price differentials) e.g. one respondent urged us to accept funds “especially [from] electricity companies who stand to benefit most in increased sales”. Others were more relaxed about aligning with EV interests and thought that benefits of their funds would outweigh the risks of partnership. Flip the Fleet’s data is, after all, valuable to EV manufacturers and suppliers which creates funding leverage. For example, “Go for the lot. The more funds coming in the better the service for us all. He who pays the piper plays the tune – so if you take funds from vested interests make sure you have demonstrated independence and a right to publish everything”. Others could see no concern at all about approaching the car manufacturers and dealers: “After all you are promoting their business”. Survey participants quite rightly pointed out that sponsorship and co-funding options exist beyond the obvious. The suggestion to “definitely exclude sponsorship from vehicle related industry, but not extend this exclusion to trade or transport interests (e.g. AA, Road Transport Federation) and electrical companies” shows we may need to think outside the car body. “Could Mercury Energy afford a hundred thousand or so? What about Z? A stretch, maybe” or perhaps we could build “closer ties with the likes of Meridian”? We could even detach our focal point from the EVs themselves and “tailor the grants for educational funding, environmental funding, and business”. There was a varied response to the prospect of seeking donations from the Flip the Fleet participants. Overall it seems participants are invested, but don’t want to be investors! Some liked the idea, but only if it didn’t put participants off: “Perhaps if we all paid an annual subscription of, say, $25 it would provide a meaningful boost, but I don’t know the numbers and if you pitch the sub too high people will walk away”. Another warned that even if it were voluntary it might put some people off: “Asking for donations from participants may reduce your contributors – if people don’t want to donate they may feel they shouldn’t participate”. It also pays to keep in mind that: “In an internet of free, asking for a fee is a challenge” and this may pose issues around forming and retaining a Flip the Fleet collective. We agree that Flip the Fleet databases wouldn’t exist without the unwavering support and data sharing from current participants. It was strongly pointed out that: “Participants are giving you information free and MUST NOT be asked to donate”. We hear you. There is risk here. One participant expressed that although they agreed with seeking donations: “this is the hard one – one wrong step, and you’re just another charity competing for donor funds …”. We, naturally enough, were delighted that you generally seem happy that some of the funds received should be used to pay us organisers of Flip the Fleet (see Fig. 2). We managed a smile when someone said “You mean you work for nothing! !” and felt warm fuzzies after reading other comments e.g. “You guys work really hard! We appreciate it!”; “Wages may not be practical but you shouldn’t make a loss so expenses for the organisers etc. is fine”. For some it’s a matter of fairness: “People doing “good” are just as entitled to a fair salary as everyone else. Pay yourselves properly!”. We appreciate the support in injecting funds here to make Flip the Fleet viable in the long-term. Although we happily put our all into accelerating EV uptake, we have to agree that: “It’s not sustainable if you don’t get paid” and “Presumably voluntary time is already getting near the maximum for a very small group, and clerical assistance will be needed if not already in place”. Halleluiah to that … we are struggling to maintain our day jobs despite some generous part-funding from the government’s Curious Minds and LEV Fund. Hired guns to generate more income were suggested: “Perhaps pay someone to fill in funding applications so you can fund all those activities”, and “Pay people to research and write: Suggestions on how to make you battery last best, updates on battery replacement options, new fast charger locations planned and finished”. Both are great suggestions to spread some of the load and increase resource support for EVs and their owners. “Battery” was another hot topic for funding uses. Along with “battery warranty advocacy” aimed at EV manufacturers, battery-related investment ideas included: “Lobbying for improved battery testing/upgrading/refurbishing/replacement services”, and working to “Engage with our university engineering schools to encourage research and students into battery technology”. One participant explained the focus on battery R&D as crucial, as the “uncertainty around battery degradation and the unmet need for replacement batteries is putting some potential purchasers off”. We all know what’s been referred to as “the 30kw battery saga” to be a significant source of apprehension, and if funding could improve battery life and performance then that would likely be money well spent. “People” sit at the centre of what we’ve achieved so far, but some urged expenditure to make it easier for them to participate. There was considerable support for investing in equipment, e.g. to “buy a bulk supply of OBD2 Dongles and cables to supply at cost and encourage data gathering”. Paying for critical research was also an option e.g. “also pay for research, such as dyno tests to determine the relationship of SOH and range”. Both ideas hold merit – investing funds back into the people driving this project strengthens our ethos of being citizen-led, independent and data-backed, and could help us gain valuable traction. Looking outside our current conglomerate for like-minded collaborators might also help to step things up a gear. A participant had the idea of: “(co)developing a standard test at the point of sale or at an AA test point for example, that indicates the health of the EV. When buying now the LeafSpy or SOH comes with lots of excuses and error margins, it would be great if an industry standard test can be developed”. This is a prime example of the kind of EV tool development that you collectively have suggested (see Fig. 3) – EV initiatives using data from the people for the people. Other EV resources, tools and equipment placed upon the table to help current users were better charging stations: “Encouraging plug-in outlets to have input for EACH plug-in variety”, and “legal advice/advocacy for owners with EV vehicle problems”. These are tangible, real scenarios where funding could make a fairly instant, positive difference to the current EV experience. As well as providing subsidies for EV purchase and maintenance, government could also come on-board with charging networks. By “suggesting to government where there are holes in the fast charger network e.g. you try and drive from Nelson to Christchurch in an old 24kWh Leaf”, funding could be allocated to aid any EV user in getting from place to place quicker and with less fuss. Only 12% of survey participants wanted funding to go into media promotion, mainly because it seems we are succeeding in spreading the word without resorting to direct advertising! Recommended media channels ranged from free options such as: “Word of mouth and the internet” and “interviews on Radio NZ National”, to lower-cost ones like: “Have a logo on an EV or two that you or others drive around”, to a full blown EV campaign. One recommended to: “avoid paying extra for it unless you can very clearly measure the benefit”, while others pointed out that: “There is no need to buy airtime and print space if you can regularly provide the news media with stories or commentary. Case in point: today’s story on RNZ that has Turners Automotive CEO speculating that it will take 25 years to “Flip the Fleet”. It is an opportunity for an EV commentator to make a statement”. Perhaps a mix of traditional and modern is the order of the day, as: “traditional media includes a wider section of the community (papers are now available online), and people without computer access or who don’t do Facebook then have access”. Not only do we need to consider the where, when and how of EV media presence – we must also cover “what” we choose to put out there! You urged for overwhelmingly positive story telling. Hot topics deemed “controversial like the Leaf 30kWh findings” may help with gaining media exposure, however it may pay to heed the advice to: “talk about the positives in the ads, not the negative 30kw saga”. Obviously we must take upmost care in how we present EV ownership. Pushing the positive seems a more productive and future-focused direction to take to avoid getting bogged down by previous speed bumps. A lone comment was shared about conferences and workshops Flip the Fleet could attend and organise, despite support for hosting such events from about 25% of survey completers: “I think there could be huge value in meet-ups combined with short, zappy presentation. Most people want to have more social engagement”. More ideas welcomed! Email us on wecan@flipthefleet.org. Some of you wondered why we asked this question about funding at all. e.g. “Why is funding an issue? Does advocacy cost too much time for some people? If so then a grant for their time is readily obtainable.” The problem is burgeoning time commitment required to run a rapidly growing coalition of willing EV owners! We are immensely grateful for the grants received so far from the Government’s Curious Minds and Low Emission Vehicle Contestable Fund. We wouldn’t have survived without them. The problem is one of growing scale and enthusiasm. Having got the system rolling and hearing your passionate enthusiasm for the kaupapa, we are determined to improve the services we provide (see https://flipthefleet.org/2018/what-do-flip-the-fleet-participants-find-most-useful/), and not let you down. It’s about reciprocity: you give your data and knowledge, we in turn will give as many hours as we can to make the most of your gift for encouraging others to join the EV owners club. Grants are hard won. Five large grants applications have been turned down so far, and each takes more than a week to prepare. This is not a bleat, or just sour grapes – all the grant awarding bodies are oversubscribed by worthy applications and they clearly got better offers than we were able to muster. But somehow, we must find a steady and secure stream of income that doesn’t divert too much time from the real work of analysing your information and communicating its implications. Many of you were happy to go with our best “professional judgement”, about how to gather and allocate funding: “Any way you like” and to: “do with it whatever you want, as I have no idea of your true goals or motivations”. Another stated “thanks for asking” but also pointed out that they could not reliably comment because they did not have “enough info on the organisation/business plan/direction.” First of all, thanks for putting your trust in us! But perhaps more importantly, this feedback shows greater clarity on future directions might be necessary for participants to feel able to join in the decision-making process. This is a tricky one – it’s tough to predict where Flip the Fleet is headed without more certainty in the funding realm to know what’s feasible and achievable. Maintain Flip the Fleet’s independence! It is vital if we are to remain a credible, citizen-led project with solid scientific integrity. This is what EV owners are looking for, and what many of you believe is needed to convert potential buyers to every day users. Although industry funding seems most obvious and we know they value our data, there is scepticism around how independent Flip the Fleet can be amidst vested interests. If we proceed, we must do so with extreme caution. Keep Flip the Fleet as a community-based platform that informs and inspires, not a charity. Participants already give free data, and that’s more than enough. Government funding seems viable and almost expected with the current political agenda. This should be a funding focal point, and could begin with outreach to EECA and MFE. Think of the wider EV impact to reach new funding pools, such as electrical companies, NZTA, AA, Road Transport Federation, climate research, as well as education and business-related EV opportunities. Develop a transparent business plan to secure the sustainability of this valuable project. Then share it and your motives with the participants. Protect our independence at all costs! Funding through data sharing – a double-edged sword?